Chondroiton Sulfate and Glucosamine is effective in moderate-to-severe knee osteoarthritis. The trial tested 606 patients with moderate-to-severe knee osteoarthritis (OA) based on a WOMAC (Western Ontario and McMaster osteoarthritis index) scale >301 (range is 0-500). Treatment with 400 mg of CS and 500 mg GH three times a day was compared with the effects of Celocoxib 200 mg once a day for 6 months. The results: Both treatments were equally effective. For CS/GH Vs. Celocoxib, both treatments resulted in decreasing pain by 50% as well as joint swelling. In summary: Using either Celocoxib or GH/CS had equal effect in decreasing joint stiffness, pain, functional limitations, and joint swelling after 6 months in the treatment of OA of the knee. Be certain to obtain your GH/CS from a trusted source which can be checked on line at Consumer Lab or the US Pharmacopeia. Side effects of Glucosamine may be an increase in glucose levels, so be careful if you are diabetic. Also if you have an allergy to shellfish, Glucosamine can be derived from materials in shellfish, so again be careful. Recommended daily doses of Glucosamine is 1,500 mg ans 1,200 mg of chondroiton. 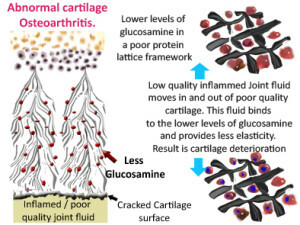 Glucosamine, Chondroitin Sulfate, and the Two in Combination NEJM GAIT trial < link to gate trial. A prior study in the New Englandd Journal of Medicine had shown results hinting that CS/GH work best in moderate-to-severe disease, but not so much is lesser OA pain.In the study discussion, it was noted: Analysis of the prespecified subgroup of patients with moderate-to severe pain demonstrated that combination therapy significantly decreased knee pain related to osteoarthritis, as measured by the primary outcome or by the OMERACT–OARSI response rate. 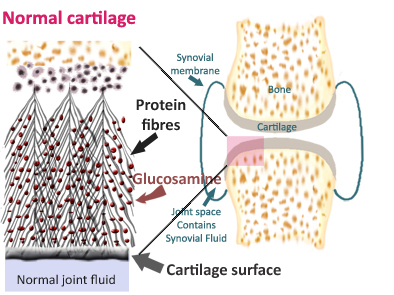 We did not identify significant benefits associated with the use of glucosamine or chondroitin sulfate alone. Although the results for glucosamine did not reach significance, the possibility of a positive effect in the subgroup of patients with moderate-to-severe pain cannot be excluded, since the difference from placebo in the OMERACT–OARSI response rate approached significance in this group. 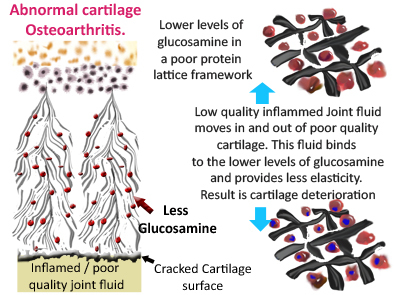 Treatment with chondroitin sulfate was associated with a significant decrease in the incidence of joint swelling, effusion, or both. We did not find an increased risk of ischemic cardiovascular events among patients who received celecoxib or among patients with diabetes who received glucosamine, but this study was not powered to assess these risks… Our finding is that the combination of glucosamine and chondroitin sulfate may have some efficacy in patients with moderate-to-severe symptoms. Be certain to lose weight and exercise. Obesity places huge stress on knees and ankles and hips. Supplements should complement these steps.